41 Methods: 240 each Allendale, Beverley, Hull, Kelso, Northumberland, Warkworth, Wearmouth; 120 each Alnwick, Annable's London, Bacup, Bamborough, Berwick, Bourne, Cambridge, Canterbury, Carlisle, Chester, Coldstream, Cunecastre, Durham, Hexham, Ipswich, Lightfoot, Lincoln, London, Morpeth, Munden, Netherseale, Newcastle, Norfolk, Norwich, Primrose, Rossendale, Sandiacre, Stamford, Surfleet, Wells, Westminster, Whitley, Wooler, York; 214 com, atw. To mark the 67th anniversary of Queen Elizabeth II's accession to the throne. Last updated Thursday, 7 February 2019 at 16:42:46. First submitted Wednesday, 6 February 2019 at 16:19:49 by John B Keeler. 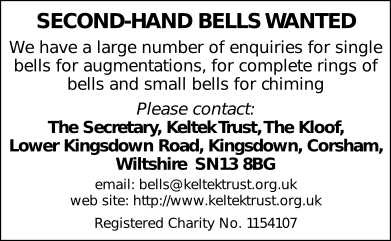 Sent for publication in The Ringing World on Thursday, 7 February 2019 at 16:43:07, and printed in issue 5626, page 182. This performance has been viewed 659 times.